10.30am to 2.30pm (Sundays and public holidays), 6pm to 10pm daily. AS CHINESE New Year approaches, every restaurant chef starts thinking of new ways to spice up your yee sang dish and make it memorable. 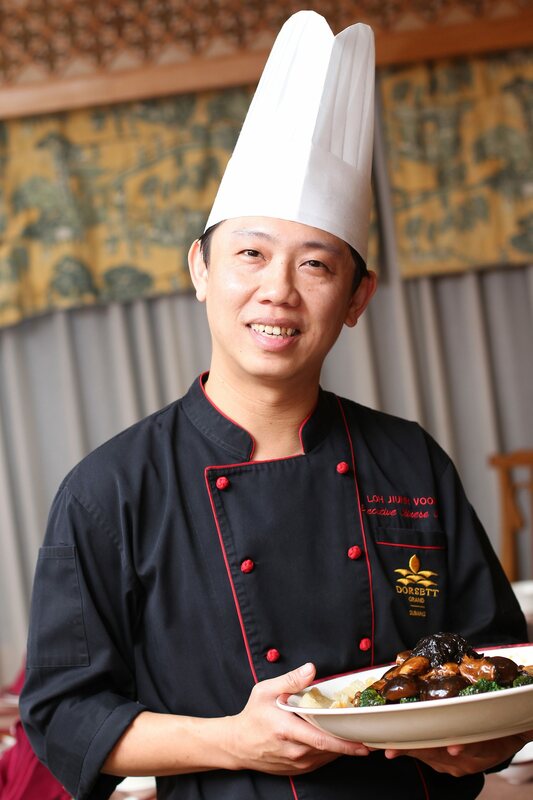 For executive Chinese chef Loh Jiun Voon at Dorsett Grand Subang’s Chinese dining establishment The Emperor, this means including new ingredients, from the unusual to the luxurious such as Korean pear, to abalone for this Chinese New Year staple. Titled “Golden Prosperity Yee Sang” (RM68 or RM118), this simple salmon yee sang comes flavoured with strips of young mango. Where you would usually get the sweet sauce overwhelming everything else, the mango helps round off flavours with a sweet and sour dimension. This year, The Emperor’s set menus, all titled after wealth or prosperity, range from “Fortune of Gold” (RM1,188 nett), “Abundance and Wealth” (RM1,388 nett) or “Luxurious Prosperity” (RM1,588 nett). Going with the middle-range “Abundance and Wealth”, the soup is a rich combo of bamboo pith fungus, kampung chicken and dried scallops infused with cordyceps, whetting the appetite for the next course of roasted duck and chicken, accompanied with marinated jellyfish. Fish is one of the highlights for any Chinese dinner, given the traditional Chinese New Year greeting “nian nian you yu”, a homophone for garnering good fortune year-on-year. The Emperor’s kitchen and Loh do not disappoint where you have fresh, steamed grouper, served simply “Hong Kong” style with hot soy sauce stock and loads of coriander and spring onion garnishing. Tiger prawns wok-fried with curry leaf and lemongrass were a tad too spicy but then again, anything hotter than a bell pepper makes me perspire. Continuing with the theme of “Abundance and Wealth”, you next have braised fish maw, served with broccoli, black mushrooms, fatt choy and dried oysters, a suitably rich dish to welcome the new year. Dried oysters have a certain powdery texture, akin to that of cooked liver, but the taste more than makes up for it, especially when eaten draped in fish maw gravy and the mushrooms again impart their own flavour to balance the taste. Of course, the savoury portion of your reunion dinner would not be complete without rice to settle everything down. Tong sui is refreshing with Fuji apple slices, snow fungus and dates. For this, you have steamed lotus leaf flavoured with items such as dried shrimp, diced chicken and yam to complete the dinner. 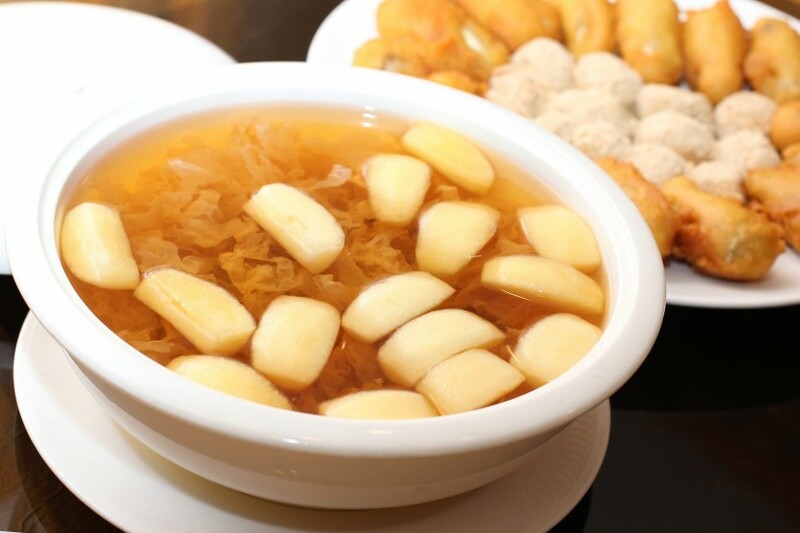 From the “Luxurious Prosperity” menu, you get double-boiled Fuji apples swimming together with snow fungus and honey dates as tong sui, to cool off the earlier savoury portion. Despite being boiled together in the syrupy mix, the apples still have some tartness to underline the bland sweetness of the tong sui, not to mention some extra bite to the fungus and soft-boiled dates. For savoury dessert, one can sample the deep-fried dough cakes, containing a slightly sweet mochi made from green tea paste. 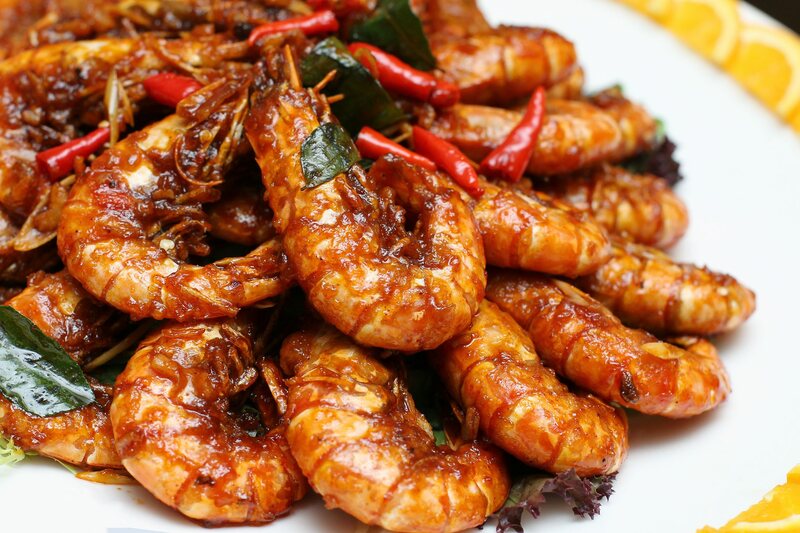 The Reunion set runs from today until Feb 22, and with every purchase (half portion to full) of the special yee sang dishes on order, patrons can also indulge in several wok-fried dishes ranging from venison to crispy Peking beef for RM8 nett.